Fortune today named Apple CEO Steve Jobs "CEO of the Decade", highlighting his role in the remaking of multiple industries and propelling Apple to continued success despite difficult economic conditions. As part of the feature, Fortune profiles Jobs and offers an interactive timeline of major Apple events over the past ten years. How's this for a gripping corporate story line: Youthful founder gets booted from his company in the 1980s, returns in the 1990s, and in the following decade survives two brushes with death, one securities-law scandal, an also-ran product lineup, and his own often unpleasant demeanor to become the dominant personality in four distinct industries, a billionaire many times over, and CEO of the most valuable company in Silicon Valley. 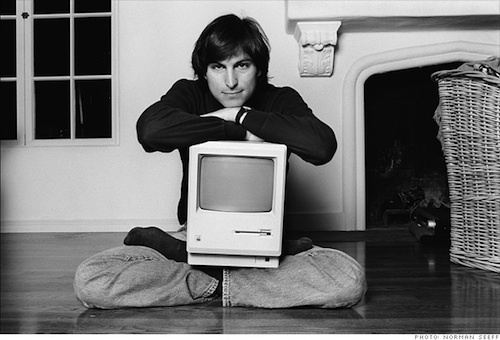 Also featured in the profile are a set of rare photos of Jobs over the years, a rundown of the "Top 10" moments in Jobs' career, and a series of testimonials from eight significant personalities in Jobs' industries describing what makes him unique. Superlatives have attached themselves to Jobs since he was a young man. Now that he's 54, merely listing his achievements is sufficient explanation of why he's Fortune's CEO of the Decade (though the superlatives continue). In the past 10 years alone he has radically and lucratively reordered three markets -- music, movies, and mobile telephones -- and his impact on his original industry, computing, has only grown.